A UCLA staff member cools down with ice cream during the hottest summer ever recorded on campus. After multiple heatwaves that literally burned the leaves off native California plants in the campus botanical garden, it almost goes without saying: 2018 was UCLA’s hottest summer ever recorded. Naturally, that included the hottest temperature ever recorded at UCLA: a blistering 111 degrees Fahrenheit on July 7, blasting past the 1939 record of 109 degrees. 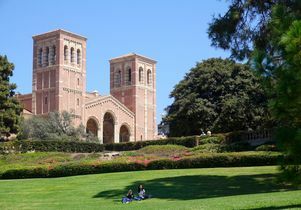 Tracking began at UCLA in 1932, not long after the campus moved from central Los Angeles to Westwood, explained James Murakami. 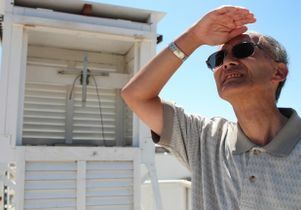 As UCLA’s meteorologist and observer for the National Weather Service, Murakami is in charge of tracking campus temperatures and forecasting the next day’s weather. 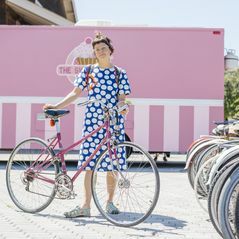 Murakami confirmed that five of UCLA’s six hottest summers have taken place in the last five years – a solid streak that began in 2014 and hasn’t let up. It’s part of a global trend as climate change makes its presence more known. The planet’s four hottest recorded years have all occurred since 2014, according to NASA. Especially for those working or living in the limited number of campus buildings and dorms that lack air conditioning, the heat was an unpleasant ordeal for a campus that usually enjoys the cooling influence of the Pacific ocean. 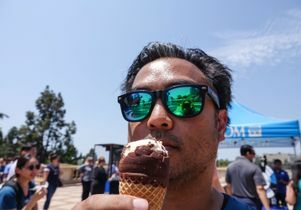 When the temperature hit 111 degrees on July 7, even the day's low temperature – 78 degrees – broke a July 1985 record as the highest overnight low ever recorded at UCLA in July. Aside from a stretch of three scorching days in September 1939, the five hottest temperatures at UCLA have all occurred since 1955. Those include 108 degrees in 2010 and the two hottest highs this year, 106 degrees on July 6 and the next day's record-breaking 111 degrees. By contrast, the five coldest campus temperatures all took place before 1957, which was the last year that the recorded temperature at UCLA hit the freezing point. It’s been a long time since the 1932 freak snowstorm, which dropped two inches of snow on campus. UCLA climate scientists, such as professor Alex Hall, have been among the many researchers predicting increases in global and local temperatures. Hall’s research shows that the Los Angeles region can expect average temperatures to increase 4-5 degrees Fahrenheit by midcentury, including roughly triple the number of extremely hot days. Meanwhile, the Sustainable LA Grand Challenge, a UCLA research initiative involving hundreds of faculty members, is developing cutting-edge research, technologies, policies and strategies aimed at shifting Los Angeles County to entirely renewable energy and local water by 2050, while enhancing ecosystem and human health. UCLA meteorologist James Murakami checking weather instrutments on the roof of the campus Math Sciences building. Campus scene from the hot summer of 2018.